Good morning friends!! Happy Friday and yes, another week has zoomed by and it’s Day of Giving Friday with a new card. Okay, I confess, this week (actually the past couple of weeks) I’ve been hunkered down designing. I think hard on these things so I’m normally quiet when I’m creating. On the crafting side, I’ve been diecutting all kinds of flowers to try with spoons and am delighted at how easy it is. Today I’m sharing a gold and white card and toyed around with a new set of flowers called Spellbinders Sweet and Succulent Contour die. As with the other spoon flowers, I shaped the petals then curled back the pointed tips using the two smallest sets of petals. For the insides of the flowers I did something different, I folded the petals in half then shaped with a burnishing tool. The basics can be seen in my video about Spoon Flowers. 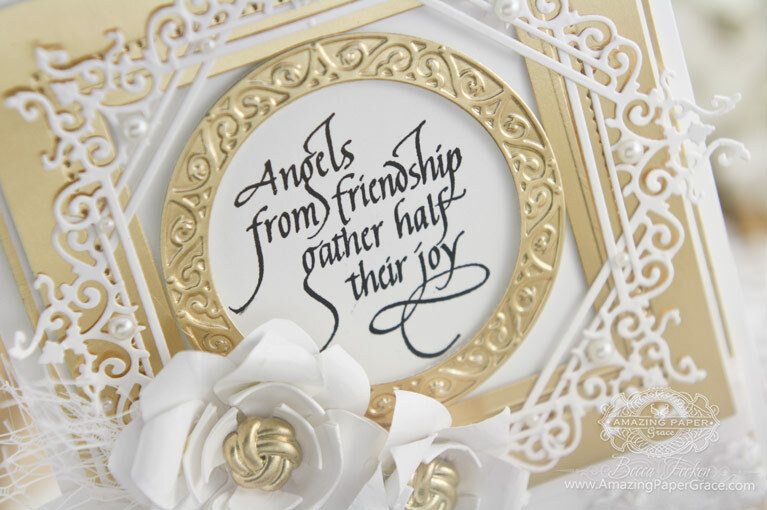 I pulled one of my favorite Quietfire Design stamps with the Angels from Friendship sentiment that so smartly fit within the round frame I was working with. It is bordered with Spellbinders Blooming Collection and Spellbinders Pierced Squares with a sweet scallop on the bottom using Spellbinders Scalloped Borders Two. I have a rather large stash of cards and last year I decided to share them with readers rather than let them sit and age. So, every Friday, I give away a card to a randomly picked reader who leaves a comment in our conversation about a thought provoking prompt I dream up to discuss – here’s a link to my FAQ’s just check out #11. For your comment today – We use technology and the internet more and more each day. You’d not be reading this post if not for the internet. How has the ease of having the world at your fingertips changed your crafting? Accessories: Spellbinders Sweet and Succulent Contour die, Spellbinders Blooming Collection, Spellbinders Pierced Squares, Spellbinders Scalloped Borders Two, silk ribbon, Recollection Pearls, Lace, Buttons I want to encourage you to pour your hearts into your handmade cards. They are so worthy of giving and the reward cannot be counted. I’m grateful that such an endeavor brings us together – a priceless gift. Thanks for stopping by friends. Gorgeous card, and so elegant! Love the layers and the gold and white combo! Your card is beautiful as always. I absolutely LOVE your cards. Your work is amazing!!! Beautiful card the blooming collection is one of my favorites! I could go on and on about the Internet. It is a way to keep up with friends and family like never before. Learn about products and techniques, with instructional videos.. I really like that and last but not least, SHOPPING LIKE NVER BEFORE!! Oh that card is just beyond gorgeous! Becca, first of all, this is, now, my favorite card. I love all of your creations, but this one is my favorite, as it reminds me of my grandmother. I have such fond and loving memories of my childhood because of my grandmother. Thank you! Absolutely stunning! I don’t any other colors are more elegant than gold and white. This is so gorgeous from the beautiful sentiment to the elegant roses. Haven’t been posting comments for sometime because of being overwhelmed in what is going on here at home. Today I’m sick and have time to play and go back and look at the beautiful cards that you have been posting! So many, many gorgeous pieces of art! Thanks once again for sharing your talent! Hiya Becca! Absolutely Love Today’s card and it is my favorite, Gold!!!! How has technology Well, for one technology has opened so many new avenues of products we never would have even known about. It has made ordering those products way too easy. For a 2nd one, it has opened the wonderful world of PINTEREST, Oh, my I get lost in there for hours just looking at the craft ideas alone! be a part of a wonderful community! Such a stunning card. Question: When using this poster board to die cut, does it leave a white edge? If so do you touch up that edge and with what? Have to say technology has put shopping at my fingertips thus saving many trips to many stores….however, I DO still shop at store – just not quite as much! I love the ease of being at home and view tutorials and blogs of fellow crafters….non-stop INSPIRATION and the ability to keep in touch easily! All in all, I am VERY happy with the part technology plays in my life. Technology has brought inspiration to my door. The blogs, websites and YouTube tutorials have made learning so much easier. My nearest scrapbook store is over two hours away, making it difficult to take classes. I have learned more because of technology but have lost the companionship of the classroom. Hello Becca, as always this is a lovely card. The age of technology has changed the way I get my inspiration and it is wonderful. Oh my goodness your card is so beautiful! I love the gold and white palette. With a change in the sentiment, this would be a stunning wedding or anniversary card! To answer your question, for me technology has changed my crafting in such a way that I have been able to learn and improve my cards so much. You are one of the first bloggers I found when I was trying to improve my craft and I’ve learned so much since. Another gorgeous card Becca. I have that Blooming Collection die and what a great use of it by double cutting and layering it!! You always have such great ideas. Thank you for sharing your incredible talent! The internet allows me to get inspiration for creating a card… sometimes it’s just the use of a die (such as you did today with that die I have,) and then I put my own spin on it. Well Becca, it is all your fault! If it weren’t for the internet I never would have become familiar with Amazing Paper Grace and your intricate and lovely dies and of course your blog. It is going on 4 years I guess since I found you and can say that I have and will continue to enjoy each of your blogs. So blessed! Gorgeous card today, Ms. Becca! Love how it all goes together! My old Lappy serves me well Becca , i am not too good with WWW. but as long i can get on the blogs and see all the beautiful work like yours i am happy. Gorgeous card again Becca . Good morning Becca, your card is simply amazing!!! How I find the internet??? 1. They say it’s a good thing. Really I spend more time shouting at the screen because it never works for me!!! 2. Everyone else goes right round the world and back again in a nano second. It takes me hours to do anything!!! 3.Sorry for the rant. If not for the web I wouldn’t have found you and all the people that comment they feel like friends!!! Hope everyone has a fabulous week!!! Becca your card is just lovely and I do like your spoon flowers, the internet has opened up a whole new world and I am a member of a few craft sites and I can say that I have actually met quite a few people and had them to stay and have life time friends, who otherwise I would never have known. I thank the internet for this. Beautiful card as usual. I love the flowers, the bow, the use of just gold & white. So striking. Having the information I can find on the Internet is a 2 edged sword as far as I am concerned. I can find so many beautiful ideas but I also see the beautiful & intricate things made & know I can’t do as well. It’s very frustrating to try & not measure up. This is a simply beautiful card, again!! The age of technology has enabled me to make friends with, and to meet up with, like minded women who live many miles away, and whom I would otherwise have never have met. Lovely, lovely card! For a long time I was completely oblivious to all the resources available to me but I started doing some research on different ways to make pockets & sleeves in cards to hold small notes (enabling lots of people to “sign” a card at the same time). That opened a wonderful door of ideas and tutorials (primarily on YouTube & Pinterest). I’m hooked on cards with “fancy folds”. I am so grateful for the generosity of people (like you!) in sharing and hope to return the favor some day. 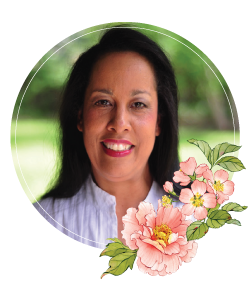 Blessings to you as you design and create – how exciting! Once upon a time, I didn’t really know what a blog was. I’d heard the term, but……. What a beautiful card, Becca I just love the colors!! And of course I love the elegance and lace, as always!! What a beautiful card Becca – love the white and gold!! Technology has enabled me to become a far better stamper/crafter than I ever was with all the online tutorials available – and also yummy stamp and die companies, and embroidery supplycompanies that I never see marketed here in New Zealand. I am on the fence about how the new tech has changed my life, crafting or otherwise. I LOVE that I can easily find new techniques (or old ones that are new to me). The inspiration that is available with the touch of a few buttons is mind blowing. So, I would say that my crafting “repertoire” has certainly grown thanks to the internet. On the other hand, my bank account has shrunk! Shopping for all those little goodies is also waaay too easy! Hi Becca. Beautiful card. I love seeing your lovely work. What a lovely card and touching sentiment! Oh so easy to answer your question today the Internet has made my crafting so much easier by being able to order supplies on line. I live in a rural area of central WA and the closest craft store is over an hour away and they have limited supplies. It is also dangerous to have the Internet as it is so so easy to hit enter and have Sooo many craft supplies, every girls dream! Becca thank you for your wonderful blog and thought provoking questions! Wow, Becca! Your card is over-the-top gorgeous! The flowers are lovely too. I didn’t think would be possible and am quite proud of myself as I’m 71 now and not great with technology but it has changed my crafting. Your card is exquisite! The colors are beautiful together, your flowers fabulous and the sentiment is amazing. Always inspired by your creativity! Your card is stunning Becca. has made it much easier to keep in touch with the outside world! To keep up with what other people craft and their supplies etc . I have the net to thank for finding your blog and you !!! My apologies for not viewing or commenting on your blog for a while but I have not been well so have not blogged myself for 10 days. I have, however, taken the opportunity to look over your stunning posts that I have missed, they truly are stunning each and every one of them. I do hope this finds you well and I look forward to future posts. 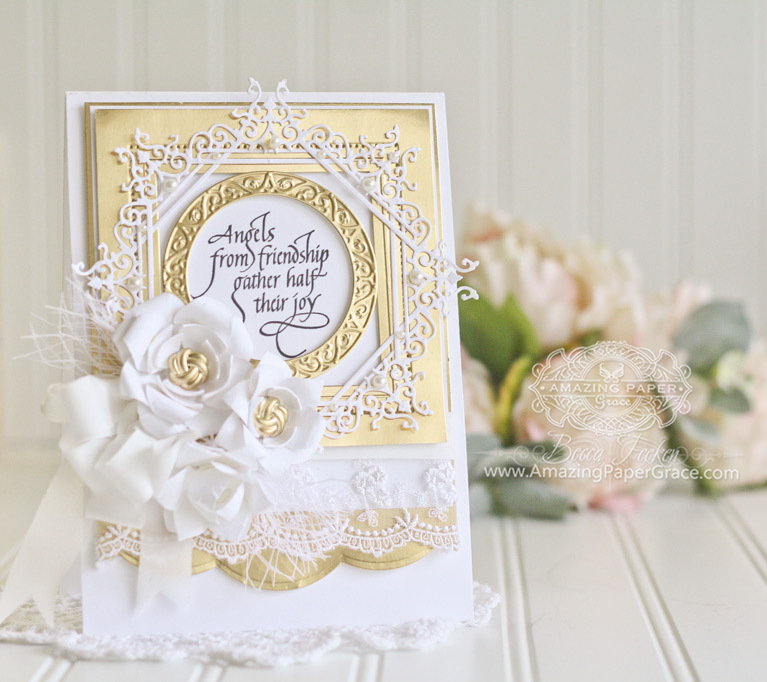 Hi Becca, This card is beautifully elegant, and the lace adds a gorgeous touch. To be honest, without the internet my crafting would be ‘non existent’ I rely on the internet for my inspiration and tips and techniques, without it I would be ‘rubbish’ and wouldn’t know how to do anything haha. oh my goodness, this card is STUNNING!! simply beautiful. Thanks also for link to spoon flowers tutorial which I have just watched…great ! This is a stunning card! I love what you did with the flower & lace! Just found all your new dies have been released, finally the wait is over! Very excited……………I am going online shopping!!! I do some genealogy, and would be lost without the internet. There is Family Search run by the Mormon church, and Ancestry which is a paid site. There are several other paid sites, but without them I would have to travel to where my ancestor was and try to locate a record of birth, death, marriage, a will. etc. I can work on my computer in my pajamas and locate many of the records. I use it in many other ways with social media (Facebook) keeping up with birthdays and my granddaughter posts pictures on Instamatic of my great grandson, so I can keep up with him. (He will be 2 in April and I’ll be able to see some of the party on Facebook and Instagram.